who hearts and who forks who. Burnt tyre, brown as dog’s breath, fog insinuates. exhaling dreams, a cloak around me. There is no fumbling creature at its heart. No tread of a bare foot on concrete. 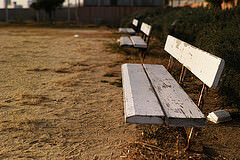 Image: "Rusty White Bench" by Halfrain.